Regency outdoor gas fireplaces, fires and fire tables offer sleek, artistic styling to complement today’s modern outdoor living spaces. Whether you are looking for a tranquil retreat or a lively background to entertain, the versatility of the Regency outdoor collection creates an endless number of possibilities for your outdoor oasis. Designed to amaze, built to last, the Regency outdoor fireplace collection is guaranteed to leave a lasting impression! You can customise your fire. If you love the feel of a wood fire, logs are a natural choice. 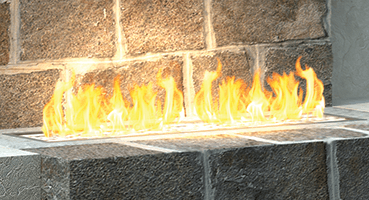 If your home has a more contemporary feel, then crystals or volcanic stones deliver a modern feel.View our outdoor gas fireplaces, fires and fire tables below, choose your basic model, then try different finishes and options.